The Galaxy Note 8.0 — the newest device in Samsung’s many-sized range of tablets, unveiled today at Mobile World Congress in Barcelona — has just managed to trump Apple’s iPad Mini in the small tablet category with one-tenth of an inch more of screen space (more on the device in our hands-on). At the same time, Samsung is also introducing a few new services and features — including expanded hovering capabilities and more apps, which it hopes will also help it gain more consumer ground against the world’s biggest tablet maker. The extra features show that Samsung sees improved services and content this as key to improving its market share in the tablet space. Samsung’s S Pen stylus has been upgraded to work both on the touchscreen of the Note 8.0 as well as with the physical navigation buttons, and Samsung is also extending the functionality of the pen in other ways. And the Air View feature, where users can initiate previews by hovering their pen over something without touching the screen, is now getting expanded to third party apps. The first of these is a new version of the Flipboard social newsreading app, where users can select and expand a tile by hovering the pen over a selection. Yes, you can argue that this is more of a gimmick than a useful element at this point: why, exactly, do you need to hover the pen over the over a tile when it’s just as easy to tap and select? And isn’t the point of the touchscreens that you can “touch” them? But I can also see how this could become more useful as the feature develops and gets used elsewhere. For example, one of the annoying issues with touchscreens are accidental clicks, such as those made on ads when you are trying to navigate around an app. Companies like Google are introducing ways of reducing accidental clicks; others are even playing around with the touchscreen to de-sensitize them for those with less precise fingers. But the hovering pen — whose pin of light needs to rest for a brief moment to select an item — could be another way to select what you want to see and do. 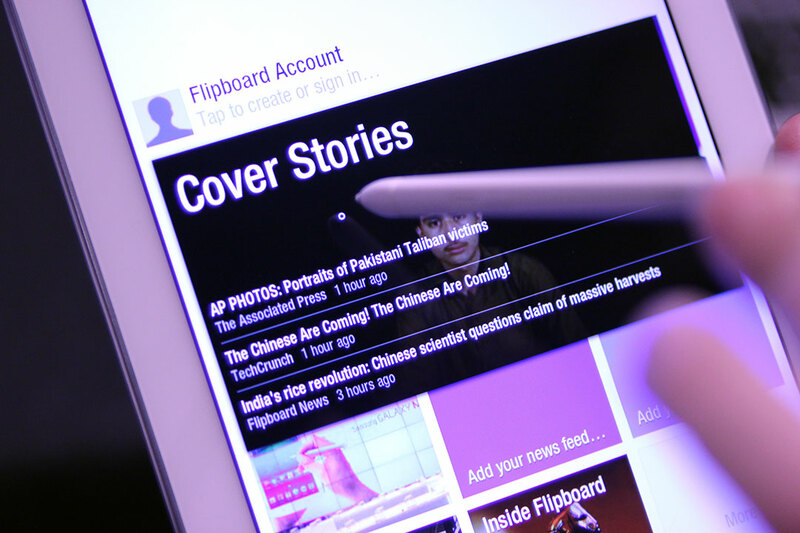 In addition to the Flipboard app, the hovering already works with file folders, email, gallery views of photos and videos, a spokesperson notes, and it will also work with more apps in the future, as developers upgrade them to recognize and respond to the S Pen’s proximity to the screen. With the Note 8.0, Samsung is also ushering in a couple of new developments on the apps front, in addition to the new version of Flipboard. In keeping with Samsung’s original vision of the Note acting as a kind of organizer and productivity device — more screen than a phone for planning; but smaller than a tablet to make it portable — Samsung has scooped an exclusive on a new Android app launch. Awesome Note, a note-taking that lets you track progress and make lists across different categories, has up to now only been available for iOS devices, where the full edition of the app for iPad retails at $4.99. Now developers Bird are releasing an Android version, and while this will also be sold as a paid app in the Google Play store, Samsung will be bundling it as a free app on the Note 8.0 “for at least a year,” according to Michael Lin, marketing manager, Samsung Electronics. Other apps that will be preloaded on the device include the newest version (2.0) of Chat-On, Samsung’s cross-platform, cross-media group and direct messaging service; Reading Mode that modifies the screen brightness for reading; and Smart Remote, Samsung’s universal remote control and electronic program guide, playing into the fact that nowadays a lot of consumers (80% in the U.S., claims Samsung) use a second device like a tablet while watching TV. Although the Galaxy Note 8.0 is incorporating, as Lin says, “all of the capabilities of a smartphone into a tablet,” the phone feature will be disabled on the device when it launches in the U.S., both in the initial WiFi version as well as in the 3G/LTE versions. Whether this is because carriers have asked Samsung to remove this to keep the device from cannibalizing handset sales, or whether it’s because of consumer taste, or for another reason entirely, is not clear. It’s a pity, because while you may not want always to talk on your tablet, it can come in useful as an occasional phone, both for video and voice calls. Our test of the phone found the voice quality decent. 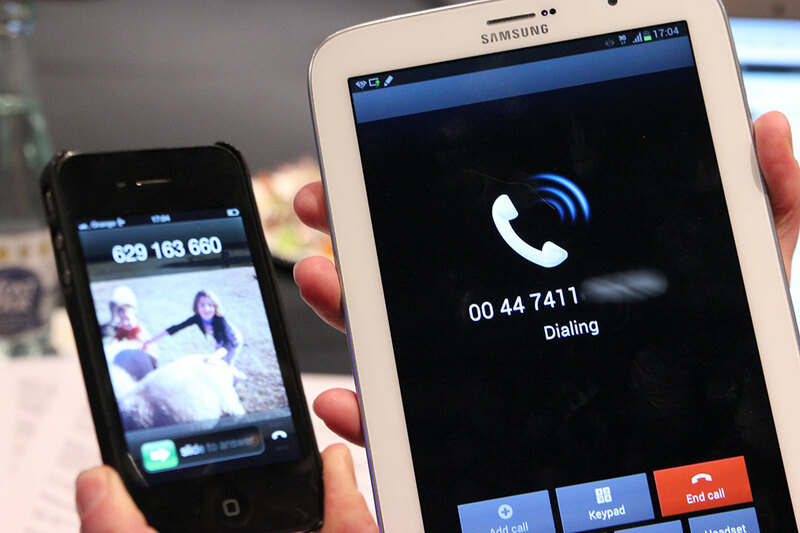 The voice calling feature will be included in the device when it launches in other parts of the world, Samsung says.